The above info came from Sailor Io, and was edited by yours truly (contact me). 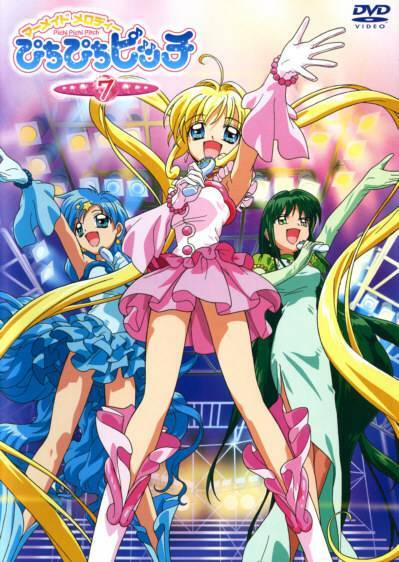 The image came from Mermaid Melody Pichi Pichi Pitch. Luchia Nanami is a mermaid princess who needs to find her voice pearl to help protect her kingdom. When evil forces start appearing, she finds her voice pearl and is able to transform into the heroine, Pink Pearl Voice! Soon she finds two companions, Hanon and Lina (Aqua Pearl Voice and Green Pearl Voice). But when strong evil forces start appearing that this trio can't defeat alone, they need to find the other mermaid princesses fast (Purple Pearl Voice, Deep Blue Pearl Voice, Yellow Pearl Voice, and Orange Pearl Voice)!